Plug the printer in to the computer and turn it on. Click on the Start Menu and Devices and Printers. Windows will detect the printer and under Unspecified put ‘TM-T88V’. Run the driver. Select Next. Select I accept the terms of the license agreement, select Next. Leave the option for Standard. Select Next. Select Add. Select EPSON TM-T88V Receipt under the drop down for Select Driver. 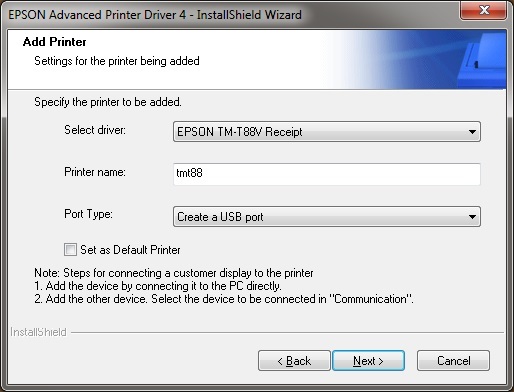 Under Printer name, enter tmt88, Port Type select Create a USB port. Leave the Set as Default Printer un-ticked. Select Next. Select Next. 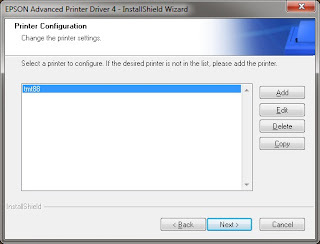 This will install the printer driver. This will take a few minutes. The computer will require a restart. Once the computer has restarted, the tmt88 printer will show within Devices and Printers.